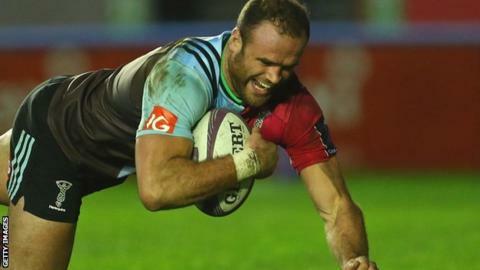 Jamie Roberts marked his Harlequins debut with a try in a heavy win over Calvisano which puts the Premiership side on the brink of a European Challenge Cup quarter-final spot. Wales centre Roberts ran in one of seven second-half scores for the hosts, overrunning their Italian opponents after leading 14-7 at the break. Ben Botica contributed 19 points, including late try of his own. The bonus-point win keeps Quins' perfect record in Europe intact. While Conor O'Shea has used the Continental competition as a chance to rest players, giving England World Cup trio Joe Marler, Chris Robshaw and Mike Brown two weeks off against Calvisano, their form has been unaffected as they notched up 109 points against the Italians in two games. England international Marland Yarde, who signed a new contract with Quins earlier in the week, opened the scoring for the Premiership side, but despite going down to 14 men following Nicola Belardo's yellow card, the visitors got level through Marco Susio. That was as close as they would come, as Kyle Sinckler went over to help restore Quins' advantage before the break and Jack Clifford got the first of an avalanche of second-half scores to complete the comfortable win. Harlequins: Swiel; Yarde, Stanley, Roberts, Chisholm; Botica, Tebaldi; Evans, Buchanan, Sinckler, Merrick, Matthews, White, Ward, Clifford (capt). Replacements: Gray, Adeniran-Olule, Jones, Treadwell, Sloan, Dickson, Hopper, Walker. Calvisano: Minozzi; De Santis, Canavosio, Chiesa, Susio; Vlaicu, Raffaele; Panico, Giovanchelli, Biancotti, Andreotti, Zanetti, Belardo, Zdrilich, Giammarioli. Replacements: Morelli, Violi, Riccioni, Beccaris, Archetti, Mbanda, Buscema, Di Giulio.